For re-roofs, new roofs, repairs or inspections, we will be happy to answer all the questions you can send our way. Proper siding will not only help keep heat in your home, it will help keep the elements along with annoying pests out. We offer custom pre-bent aluminum cladding to protect exposed wood products such as window battens and frames, beams, columns, and door frames. No home is complete without proper water drainage to keep your new siding and roof in proper condition. Alfa Roofing & Siding Ltd. has been focusing on you, the customer, since 1991. We pride ourselves in providing excellent customer service and quality workmanship. We work with honesty and integrity and staff expert managers, supervisors and tradespeople. We provide satisfaction and ease of mind through our knowledge and experience throughout the duration of the project. We are certified installers of GAF products. Contact us today. 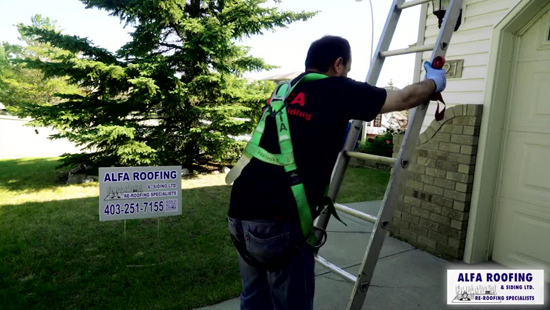 Because Alfa Roofing & Siding Ltd. is over 25 years old, we have had the opportunity to be of service to a number of repeat customers going back to the 1990's.